In order to meet the diversified expectations of our esteemed clients, we are offering them a wide assortment of Badger Shaving Brushes which are fabricated by the experts. We sourced the required raw material only from the well-established vendors of the market in order to make them as per the international quality standards. Shaving brush made of immitation badger hair. Shaving brush in bristles and Nylon with exotic wooden handle range. 'Ashish' Supreme Shaving Brush - offers the latest in men's fashion to soften the toughest beard with superior soft crimped nylon bristles . It is crafted with care to give that feathery touch & generates rich lather so that shaving becomes a luxury & not a necessity. 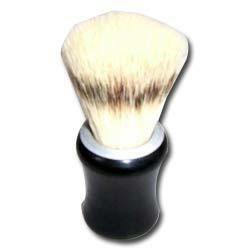 Also available 'Pearl' Shaving Brush as a standard economical model. Mariancare manufactures quality shaving brushes as per the requirement of our customers that get produced at a large scale with the desired branding. Marian Hygiene Care Products Pvt. Ltd.
We manufacture high quality shaving brushes. The brush is designed and made to give you a rich shaving experience. The high quality bristles give you a close shave while the design of the handle give a good holding grip. Apart this, we also manufacture brushes as per client's requirement.